An unusual museum 30 feet (nine meters) beneath Fort Canning Hill, the secretive British military fort known as Battlebox once played an important role in Singapore’s history. Used by the Malaya Command to defend Singapore during World War II, the bunker was where Lieutenant-General Arthur Percival ultimately surrendered Singapore to the Japanese, marking the decline of the British Empire. Today, the cavernous space is filled with lifelike wax mannequins and antique photos and video clips that depict what it was like to live and strategize within the gray, 29-room labyrinth during the final days of the war. While the Battlebox Visitor Center is open to all, most travelers join an hour-long historical tour down into the Battlebox to view the simple lair. Follow a guide through an unassuming green metal door built into the side of Fort Canning Hill and down a cement staircase into the subterranean command center to see wax army figures huddled around and contemplating military maps, reading orders in the command rooms, and relaying messages in the signal room and cipher office. Though most of the original furniture and military equipment were looted after the war, informative guides make the space come alive with detailed stories and insight about relics from the era, such as the Japanese Morse code etched into bunker walls. The underground Battlebox is only accessible via guided tour. Photography and note taking are not allowed inside the Battlebox. Most tours start and end at the air-conditioned Battlebox Visitor Center, which is open daily from 9:30am to 5:30pm and can provide a nice respite on hot days. Restaurants and restrooms can be found at the nearby Fort Canning Centre. While tour content is meant for mature audience, tours do not feature any disturbing images and children are welcome. 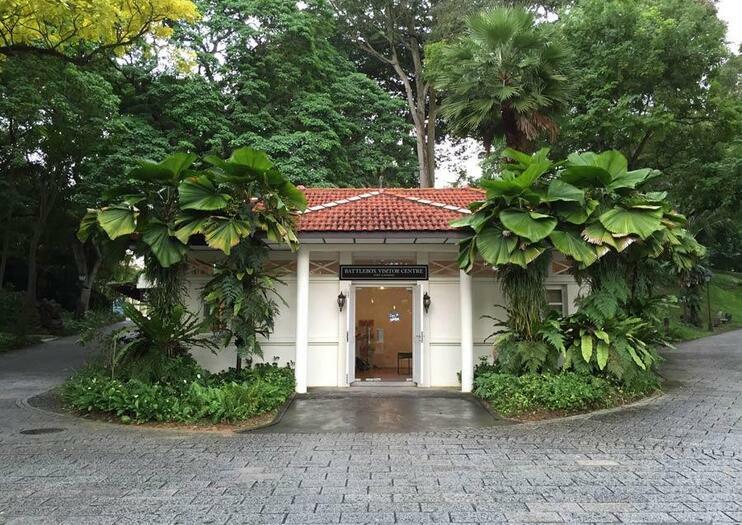 Tucked into Fort Canning Park, near where the Singapore River meets the Straits of Malacca, Battlebox is most easily accessed by taxi or free Singapore Tourism Board shuttles that run a loop around museums in the Central Business District. Ask to be dropped off at the roundabout at the entrance to Hotel Fort Canning (the Battlebox Visitor Center is just beyond the roundabout). The site can also be accessed by public transit; it’s a short walk and two sets of staircases up from the Dhoby Ghaut MRT Station’s Exit B to Park Mall. Battlebox is open from 9:30am to 5:30pm with three tours on Mondays (at 1:30, 2:45, and 4pm) and five tours all other days of the week (at 9:45, 11am, 1:30, 2:45, and 4pm). The longer, two-hour “Of Graves, Guns, and Battles” tour costs a bit more and runs Mondays and Thursdays at 2pm. It’s best to reserve tour tickets in advance if planning to visit on a weekend or public holiday. There’s more to Fort Canning Park than just the Battlebox — some tours couple a visit with stops at other historic remnants via the Colonial History Walking Trail. See graves of early European settlers, an experimental spice grove planted with nutmeg and clove, and the crumbling traces of an ancient Malay kingdom. For a broad picture of British military history in Singapore, swing by the Fort Gate, Fort Wall, and the nine-pound cannon, which protected Singapore from naval invasions in the late 19th century. Explore a former British underground command center on a 1-hour tour of The Battlebox, a bomb-proof shelter beneath Singapore’s Fort Canning. Learn about Singapore and Britain’s tragic WWII history, hear the inside stories and strategies behind the dramatic British surrender. Learn about the historic battles of Singapore on a 2.5-hour tour of the Battlebox, a former World War II command center located in the heart of the city. Follow an informative guide through the 26-room warren under Fort Canning Hill, an unsuspecting spot steeped in history. You’ll visit a cemetery and hear about the country’s fate from the 14th century to the modern era.